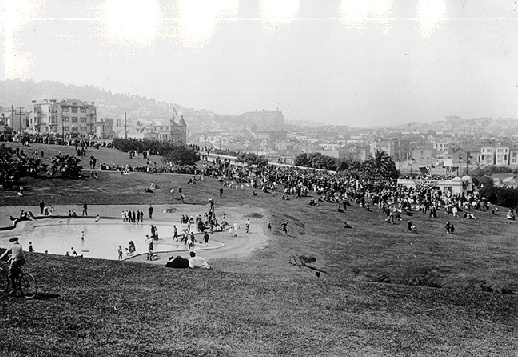 1917 View west/northwest across Dolores Park from Dolores between 19th and 20th Sts. Thousands more Forty-niners visited Mission Dolores, but most were not looking for quiet and solitude, like Frederick Gerstacker. By 1851 and 1852 the area around the church had become an entertainment district -- and one that would have appalled the good Catholic fathers of earlier decades. A brewery, several saloons, a gambling den, a dance hall and several dozen Latin American prostitutes occupied the dilapidated barracks, workshops and barns near the church. And once all the Mission's old buildings were fully occupied, the Forty-niners pitched tents in a variety of colors, where they drank, gambled, and whored the weekends away. Despite its proximity to San Francisco, the Mission district was often a several-hour ride or walk in 1850, because the trail between the church and Portsmouth Square went through a swamp, several creeks, and numerous sand hills. But the opening of the Mission Plank Road in 1851 brought the Mission Dolores and all its unsavory entertainments within an easy ride of town. For twenty-five cents, a horseman could use the forty-foot-wide toll road which ran along present day Mission Street from Third to 16th Streets. The toll for a wagon and two horses was seventy-five cents and a four-horse team, one dollar. Now that the Mission Dolores was readily accessible to the rest of the city, well-to-do San Franciscans like banker Francis L. A. Pioche and hotel owner Robert B. Woodward built comfortable country houses in the Mission district. A number of Forty-niners who didn't strike it rich in the gold fields bought farms and started raising chickens and vegetables which they sold to hotels and restaurants in town. Pioneer Race Track as seen on the 1859 U.S. Coastal Survey Map. 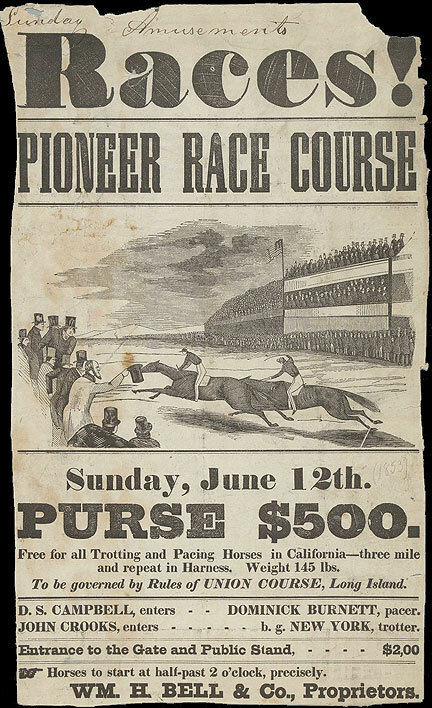 Advertisement for Pioneer Race Track, 1850s. And even though the gamblers and prostitutes began to leave the ramshackle buildings near the church, more and more San Franciscans rode out to the Mission district to have some fun. 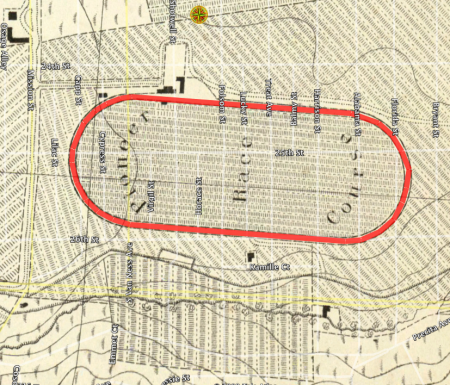 In 1852 the Pioneer Race Track opened on the site bounded by Mission, Bryant, 24th, and Army Streets. A beer garden called the Willows was established near the end of the Mission Plank Road in the late 1850s. 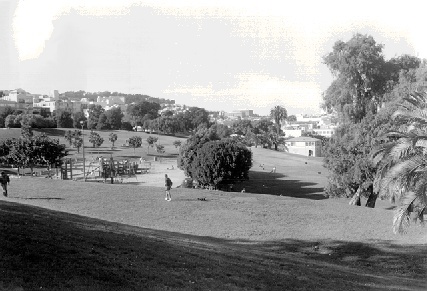 The grounds, which extended from 17th to 19th Streets and through to Valencia Street, included a small meadow, hills, and a stream shaded by willows. Other facilities included a wooden platform for dancing, athletic fields, and tables and chairs for snacks and refreshments. Serious drinkers gathered at the Willows Saloon on Mission Street.